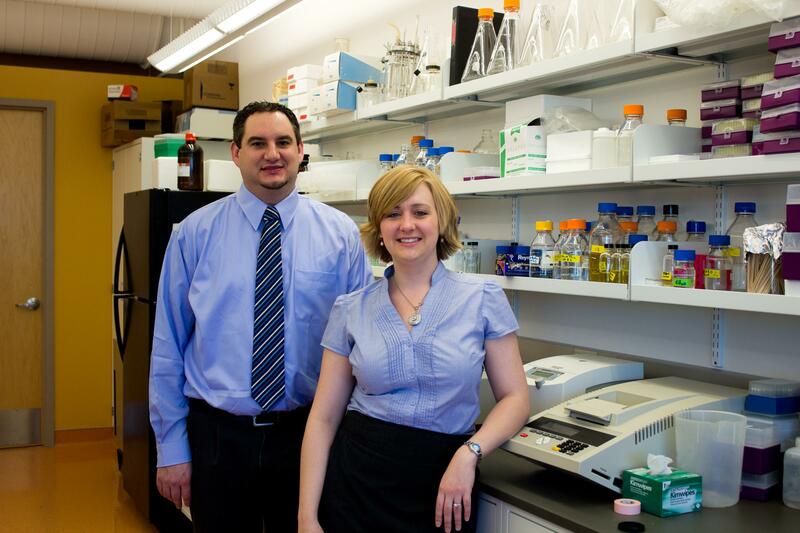 Katie and Brian Thompson started Elemental Enzymes a few years ago. Researchers Katie and Brian Thompson of the University of Missouri took the plunge to start a company a few years ago. They relocated to the Missouri Innovation Center in Columbia, which provides them office space and mentorship support. The husband and wife team developed a technology that stabilizes enzymes. They created a platform technology, which has applications in many industries. The technology is comparable to the game Pac-Man. Imagine each enzyme in the world like a Pac-Man. You know, the little yellow circles munching dots while avoiding ghosts in the video game. They exist on their own and can eat or be eaten by other enzymes. They can also fall apart naturally under intense conditions. This causes them to lose their power. The Thompsons are working to make enzymes better by attaching them to more stable molecules. In turn, they become stronger and can keep working. “Enzymes are the workhorses of life. They are the proteins that help you carry out all the chemical reactions in your body,” says Katie Thompson. In the lab, on the left is the molecular side of the lab with test tubes and beakers. On the right are rows of soil and plants for testing. This allows them to work on the molecular and agriculture research at the same time. At the beginning, the market opportunities seemed endless for the company. “Almost everyone we’ve met has had an idea about how we can use an enzyme in a different market, and we are still getting those ideas,” says Katie Thompson. Paul Bateson was one of the commercialization counselors, who helped them establish their market. He works at the Small Business Technology Development Center. “They came to us early on and said hey we are getting some sniffs around this in the Ag industry, we don’t much about it. So we are the ones that provided them with the initial information to explore that market,” Bateson says. The Kauffman Foundation ranks entrepreneurship in each state every year. Historically, Missouri has ranked near the top in the country for research, but near the bottom for commercializing that research. The Kauffman Foundation released a report in 2012, in which Missouri ranked sixth in the country as a place for commercialization. Jason Hall, deputy director of the Department of Economic Development says that Missouri is ranking better because of recent state investments in start-up companies. Some of these recent investments include the Missouri IDEA (Innovation, Development, Entrepreneurship Advancement Funds, which are distributed through the Missouri Technology Corporation, a public-private partnership created by Missouri legislators to invest in start-up companies. The IDEA Funds work to provide needed capital at various stages of a company’s development, and requires matching support from the company’s own sources. The state’s economic development agencies help connect companies to needed capital in industries like agriculture. “Those are areas where Missouri has a strong research base, therefore it creates an environment where companies that are created out of that research are more likely to stay here,” says Jason Hall deputy director of the Department of Economic Development. The Thompsons work with agriculture contacts they made in the Midwest for guidance, since they’re creating products in a field they’ve never seen. Brian Thompson says it makes a lot of sense to develop the company in the agriculture industry. Elemental Enzymes is working on many other applications for its technology, including reducing toxins in soil and air. “We have like four major twists to our technology that would allow us to attack other markets. It would be just too much to handle if we tried it right now, but it’s really exciting. This company could continue to grow for a long, long time,” says Brian Thompson. Elemental Enzymes is a four person company now. But Brian says although they are small, he anticipates needing to hire more people soon and quickly.